Joseph Gagnon and Brian Conville, two ocean rowers, were rescued by the Irish Coast Guard from their overturned boat off the coast of Mizen Head, County Cork, after the activation of their Ocean Signal rescueME EPIRB1 — the rowers were attempting a North Atlantic crossing. Ocean rowers Joseph Gagnon (left) and Brian Conville were rescued after their boat capsized near the end of a North Atlantic crossing attempt. The two were just hours away from completing a record-breaking North Atlantic crossing when their boat capsized in rough seas about 165 miles from Ireland on July 21. The alarm was raised when their Ocean Signal EPIRB (Emergency Position Indicating Radio Beacon) sent out an automatic alert when the device became submerged after the boat turned over. The Coast Guard Rescue Coordination Centre in Valentia dispatched the Waterford-based Sikorsky Rescue 117 helicopter, with Irish Air Corps Casa 253 providing top cover. The two crew were winched from the sea and transported to Tralee Hospital in Co Kerry where they were treated for hypothermia. 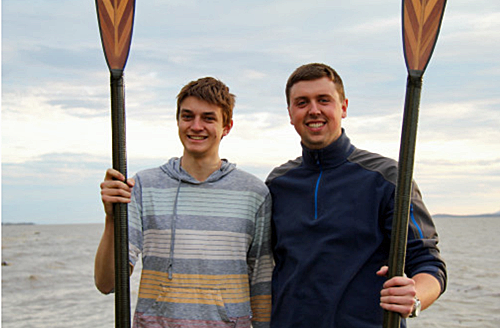 After leaving St John’s, Newfoundland, Canada on June 13, the rowers had looked set to become the first duo to cross the Atlantic, west to east, from Canada in under 40 days and the youngest pair to complete the voyage, before they ran into difficulty. They had originally aimed to land in France but were forced to shorten their trip due to challenging weather and injuries and decided to head for Co Cork instead. An EPIRB provides the boat’s essential link to the emergency services. 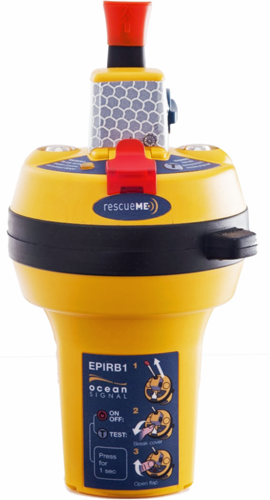 The Ocean Signal rescueME EPIRB1 is the most compact on the market and was therefore ideal for the small rowing vessel. Automatically activating once immersed in water, the Ocean Signal EPIRB communicates the location via the 406 MHz Cospas-Sarsat satellite system with position provided by an integrated 66-channel GPS receiver and 121.5 MHz homing beacon. Despite the ordeal, Joseph is still planning to cross the 5,000 kilometres separating Canada and France in 2018 and become the youngest single ocean rower.